Roughly 20 firms have submitted their applications to the Board of Investment (BoI) to produce battery electric vehicles (EVs) in the country, says the Electric Vehicle Association of Thailand (EVAT). "The association is very optimistic about the future of the EV market in Thailand after seeing many applications from manufacturers," said president Yossapong Laoonual. "Compared with other countries in Southeast Asia, Thailand has the most clear-cut policy for EVs." The government is keen to upgrade the country's automotive industry to become a global EV hub in the long term. ing three types of EVs: hybrid, plugin hybrid and battery. The privileges include tax holidays of 5-8 years and import duty exemptions for cars and machinery. The application for plug-in hybrid and battery EVs ended on Dec 28. Toyota, Honda, Nissan, Mazda, SAIC Motor-CP, Mercedes-Benz and BMW were granted BoI incentives for hybrid and plug-in hybrid EVs, while only FOMM won for battery EVs, making mini-cars. In addition, Toyota, Mazda, Nissan and Mitsubishi also announced they submitted their applications for battery EVs to the BoI. Mr Yossapong said the many applications indicate the interest in EV. "Their investment projects aim to make their local operations the hub in Southeast Asia," he said. "The industry likely will not see actual investment in battery EVs for three years as the BoI granted a three-year grace period for carmakers to prepare." The EVAT forecasts battery EVs to double in 2019 from 1,373 units last year. Of those, 1,111 units were electric motorcycles, while 139 were electric passenger cars. Hybrid and plug-in hybrid EVs totalled 124,033 cars as of 2018. Vivek Vaidya, senior vice-president for mobility at Frost & Sullivan, said Asean countries have ambitious policies and goals for EV production, but the plans are weak and diffuse in terms of implementation, calling into question their viability. Thailand has released incentive programmes to attract investment, aiming to be the global hub for EV manufacturing, even integrating economic zone development with EV development," Mr Vaidya said. "The country only has a framework on the supply side, such as BoI incentives and an excise tax cut for locally made EVs, but there is no incentive on the demand side for local motorists." According to Frost & Sullivan, Indonesia intends to release a presidential regulation to accelerate its EV development, focusing on pushing adoption at all levels. 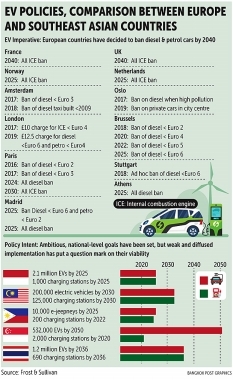 Malaysia's approach is technology neutral, not limited to EVs.